Not alone. 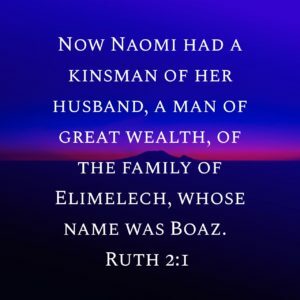 The whole first chapter of Ruth we see Naomi believing and acting like she is all alone. But now we start chapter 2. Read Ruth 2:1. She had a kinsman. There was family. No mention of him anywhere in chapter 1, but here, we see the beginnings of the plan that God was working out. Even in the darkest, most alone times of life, God is always with us. But more than that God is almost always working in the background to be able to show us that He is with us. Will we allow Him to turn the page and start a new chapter for us or will we keep ourselves stuck on chapter one of God’s story?